I just want everyone to know that this is my last day at work before Christmas vacation… woo hoo!!! Ok, fine, fine… FINE! I’m a sappy sentimentalist and I like “It’s A Wonderful Life”. I watch it every year during December. Last night was my annual viewing, and yes, I enjoyed it. So go on you naysayers, you cynicists, you apathetics, make fun of me… see what I care. I will continue to watch “It’s A Wonderful Life” every year, and I will continue to be encouraged by it’s simple, yet profound, look at human nature and will be reminded once again that Christmas is a holiday to celebrate the higher things of love, relationships, and life. I happen to think it’s a fantastic movie, and it’s one of my favorites. Anyways, good ol’ Microsoft. I almost feel guilty dedicating a blog to them, but since they have burst into the market this year with the self proclaimed “iPod Killer”… well, they’ve brought this upon themselves. So the brains in Redmond, WA all sat around a table one afternoon and said to themselves, gosh, we need to get into this digital music business. Forget the fact that they already had a digital music store called MSN Music that failed miserably… it pretty much sucked. The brains of Redmond decided to call their new invention Zune. It rhymes with “tune” I guess, which is kinda like iTunes. So, Zune it is. They spent months upon months planning the great “iPod Killer”. Throughout the whole thing I wanted to keep an open mind, because you know competition is good and I wished for them the best. So the Zune was created in top secrecy, utilizing I’m sure absurd amounts of money that has been collecting dust in an aircraft carrier parked in the Pudget Sound. At first glance, the Zune looks decently cool – it’s got a nice big, color video screen, it’s about the same size as an iPod, yet it has some sense of character that places it on it’s own. It comes with a built in FM radio and has a wireless sharing function. Then you pick it up. When I first held the Zune about three months ago, my initial thought was, “my gosh, it feels like a toy.” One of the other guys at my label joked, “yeah, they should just stick a Fisher Price sticker on it”… ouch. But there’s truth in that. I pick it up and it just has this clunky feel to it. I shake it… dear heavens, there’s things rattling in there. Yikes. Now here’s one of their biggest mistakes. Obviously they didn’t want to remove themselves to far from the iPod design, so they included a scroll wheel… except the scroll wheel doesn’t scroll. It’s a four directional button in the shape of a circle! They would have been better off putting an old four-arrow Nintendo controller on it. The big video screen is cool I guess, but the resolution is about the same as the video iPod, which means in terms of quality, the iPod has the better screen. The buttons are so small, spaced so awkwardly at the bottom of the device that it almost forces it to be a two handed player… unlike my iPod which I can simply hold in one hand and operate with my thumb while I drive down the road. On top of the buttons being small, they don’t light up so you can’t see them in the dark, and they’re also difficult to press, so after a while your fingers just get tired. The thing is really hard to balance – in fact, I would say it is off balance, which means that when holding it in your hands it feels awkward, and you’re more prone to dropping it. At this point, a drop may do it some good. There’s already stuff rattling around inside so it probably won’t hurt anything. 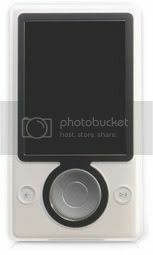 The Zune comes in three colors: white, black, and poop. It comes with a little bag that is so tight at the opening you can hardly get the thing back in there. The wireless sharing function… leaves a lot to be desired. If you want to simply send a song to someone, it stops the music you’re currently playing. Same when you receive a song. And all the potential the wireless function has to be cool is lost because you can’t “request” a neighboring Zune for a song… you have to go physically ask the person for them to send the song, and then you can receive it… that would be like me having to call you on the phone to ask you to send an email. As I was discussing with my friend the other day – the difference between an iPod and a Zune is this: Apple designed the iPod… Microsoft engineered the Zune. And you can tell. It’s all function OVER form, and I think that’s a mistake when it comes to “social electronics”. 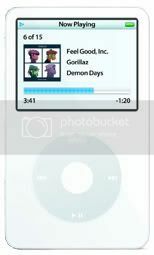 MP3 players are more than just a functional device – the lend insight to your way of life and they are a fashion accessory. They are interwoven into the way you live your life and become integral to the way you experience entertainment. For as much as Zune is promoting the “social” aspect of their new device, I feel they’ve really fallen short on making it something people want to engage in a social setting. If the Zune is the “iPod killer”, then they’ve gone into battle with nerf guns. Two years ago my friend Ashley was diagnosed with cancer… again. When she was in highschool (before I knew her) she had already had a bout with it, but with a lot of cemo came through it ok. But this time was really bad. It had gotten into her bones and was affecting her spine and the base of her tailbone. I don’t know a lot about cancer, but I know that when it gets that deep it’s not a good thing. Medically they were out of options. The doctor’s gave her three months to live, and we braced for the worst. Ashley is one of the sweetest, most caring, Godly girls I know, and like it always does with people like that, it just pains you to face the reality that they could die very soon. I remember in those first few weeks I was so diligent about praying for her. I took it upon myself to be her prayer warrior (as many did I’m sure). There were days I would pray multiple times, begging God on her behalf to heal her in the midst of such a tragic outlook. Other days I would be really rushed, but would not fail to pray at least once, even if just for a few seconds. It was a good experience to be so closely and purposefully tied to something I was praying for – a lot times I feel my prayers are meaningless, and drifting off into empty space. But praying for someone’s life wasn’t meaningless. I remember feeling good about myself as I prayed daily for her – one month turned into two, which turned into three. Summer rolled around, and I figured she was living on borrowed time. I was grateful for that, for her sake – more time to spend with her family and such. And as the weeks drew on, my habitual praying eventually slowed down and then altogether stopped. It’s weird how that works. The first few months I was in such a driven, almost panicked state, but then as time goes on the sense of urgency dwindles. Over the summer Ashley and her mom started looking into some alternative treatments for the cancer. They looked into a lot of nutritionally based stuff, and some really advanced radiation treatment. Some stuff seemed to help, but it was hard to tell. Ashley’s mom would send us email updates from her clinic in Houston, and you know how those are… she tries to stay really positive but you can read between the lines and know things aren’t going all that well. Time goes on. Six months turns into a year, which turns into a year and a half… in October we get an email saying that the most recent scans show that the tumors have spread and grown. One is pushing against her pancreas. Another is located at the base of her neck – not a good place for a tumor. And while I want to stay positive, and stay faithful, deep down I know it’s just a matter of time. They’ve been doing some pretty invasive cemo on her, and I know it’s getting her down – emotionally, physically, etc. And now it’s December. I haven’t heard an update from Ashley in quite a while, which honestly is typical… when things aren’t going all that well, the updates are a lot less frequent. So I’m walking out of my house this morning and I get a text from my friend Brian that says, “Ashley is healed! The cancer is gone!”. WHAT! I call him up and get the full story – it’s true, the cancer is gone. Ashley took a step of faith a couple months ago and decided to stop the radiation for the time being… and what do you know, the girl doesn’t have one trace of a tumor in her. They did a full CT scan last week and she’s completely clean! Amazing. I’m awed and amazed. I’m so happy for Ashley. I’m disappointed in myself for not continuing to have faith throughout the whole thing. I can’t comprehend the power of supernatural healing, but I’m glad it still happens. Yikes! Almost two whole weeks since my last post. I am shame-faced. I am literally sitting in a meeting right now that is scheduled to last three hours. I am literally not even paying attention, and for good reason I might add. This is one of those stupid meetings that I get dragged into once a month because I need to be “in the loop”. There’s 18 people in here right now. Three of them are talking with each other… discussing budget stuff. Blah. The purpose of this meeting is to determine the number of units to ship into stores on upcoming projects… I work in digital retail – I don’t ship to stores. I so don’t care. In other news, we finally got the Christmas tree up. But of course, the cat wanted to play with all of the ornaments, so Steph took all of the ornaments off the bottom half of our tree. Our tree is like a guy doing a meeting on a webcam… he’s got a shirt and tie on up top, but only wearing boxers off camera. Ok, that was a bad analogy. Anyways, I suppose I should try to pretend like I’m paying attention here….